For generations, different cultures have been able to preserve vegetables for long periods even without freezers or canning machines by using lacto-fermentation. Sauerkraut, or "sour cabbage," is an example of such fermented vegetable. Sauerkraut has a long shelf life because of the lactic acid bacteria it contains, which produces lactic acid and gives sauerkraut its distinctive sour taste. Sauerkraut should not be confused with coleslaw, which gets its acidic taste from vinegar. 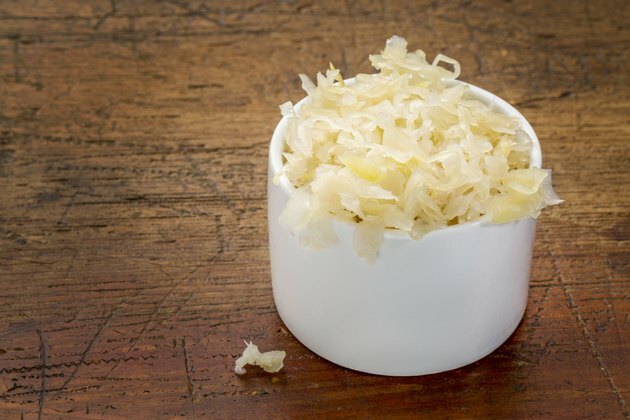 Sauerkraut is a great lactose- and dairy-free source of a wide variety of probiotics for only the fraction of the cost of a regular probiotic supplement. During the fermentation process used to produce sauerkraut, the lactic acid bacteria naturally present on the cabbage leaves starts fermenting the fermentable sugar in the cabbage. There is a rapid turnover of different species of lactic acid bacteria, which go from the less acid tolerant to the more acid tolerant species starting within two to three days of fermentation until the fermentation process is completed, usually after two weeks. The concentrations of lactic acid bacteria in sauerkraut reaches at least 1 billion CFU, or colony forming units, per gram. Four main species of lactic acid bacteria are commonly present in sauerkraut: Leuconostoc mesenteroides, Lactobacillus brevis, Pediococcus pentosaceus and Lactobacillus plantarum. Sauerkraut also can contain other species, such as Weissella species, Lactobacillus curvatus, Lactobacillus sakei, Lactobacillus coryniformis, Lactococcus lactis subsp lactis, Leuconostoc fallax, Leuconostoc citreum and Leuconostoc argentinum, according to the December 2007 issue of "Applied and Environmental Microbiology." Each batch of sauerkraut can contain different species of gut-friendly probiotics in different proportions, making your sauerkraut a different combination of probiotics each time. Probiotics, such as lactic acid bacteria, contribute to the health of your gut flora. Consuming probiotics, whether in a supplement or in sauerkraut, helps make some of the nutrients you consume more bioavailable, regulate your intestinal transit time to prevent both constipation and diarrhea, and enhance your immune system. Probiotics also can protect you against potentially harmful bacteria. You can easily prepare your own sauerkraut for a cheap source of probiotics. Shred a medium cabbage and mix with 1 tbsp. of sea salt and seasonings to taste. Pound for about 10 minutes or until the cabbage releases juices. Put in a mason jar and press down firmly until the juices come at the top of the cabbage. Cover tightly and leave at room temperature for three days before transferring to the refrigerator. Your sauerkraut is now ready to serve but it will preserve for months. Its taste also improves with age. Remember to consume your sauerkraut raw to benefit from the probiotics it contains. Heating the sauerkraut kills its gut-friendly bacteria.